Although there are thirty-five known Petunia species, most types of Petunia plant grown in the garden are hybrids. Plants are annuals, and the genus is native to South America. As a member of the Solanaceae family it is closely related to food staples such as tomatoes, Aubergine, and peppers. Ornamental-wise, it is related to plants such as Browallia, Salpiglossis sinuate, and Physalis. Although, usually grown as hybrids some of the more known Petunia species include the Large White Petunia (Petunia axillaris, fragrant at night); the extremely rare red-flowered Petunia exserta; and Petunia integrifolia (purple flowered), which along with P. axillaris was used to create the first garden Petunia hybrid. There are four major classifications of Petunia × hybrida: Hedgiflora (also includes the Petunia surfinia group); Grandiflora; Multiflora; and Milliflora. Cultivars can be single or double flowered. Hedgiflora, and surfinia are low growing spreading plants, making them ideal for use as ground-cover. Petunia Surfinia by Joanna Papanikolaou. Grandiflora have large flowers (4 inches (10 cm)), and a large array of colors. Petunia Grandiflora supertunia by beautifulcataya. Multiflora has flowers of about 2 inches (5 cm). 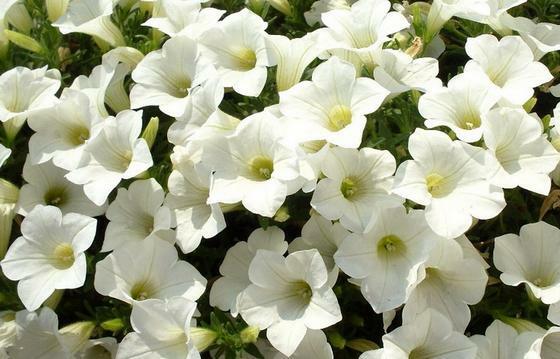 These are more tolerant than Petunia Grandiflora, and not as susceptible to damage from heavy rains or bright sunlight. They are often grown as an hanging basket plant. Petunia cv. Multiflora by Jim, the Photographer. Milliflora / Floribunda have flowers of about 1 inch (2.5 cm). They can tolerate very bad weather, and make great container plants. They are also ideal for use as edging and garden bed plants. Petunia milliflora 'Shock Wave' by Scott Zona. 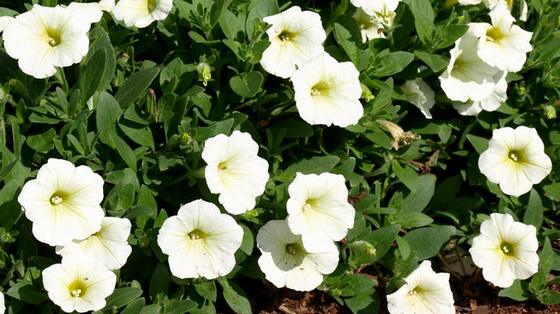 Due to the many different types of Petunia hybrida it is difficult to give an exact description of each plant. 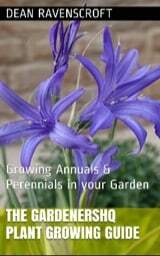 Therefore, what follows is a general guide with some information on specific cultivars. 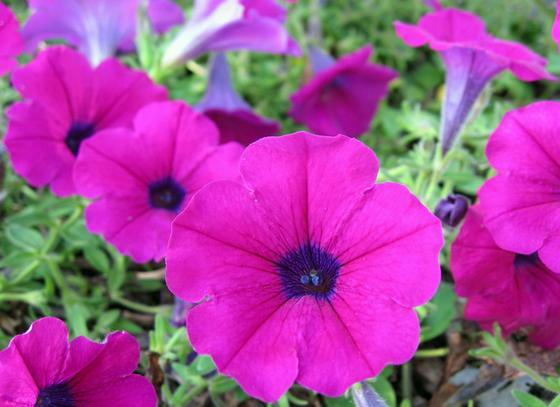 Petunia plants range in height from 8 to 30 inches (20 to 75 cm) with spreads from 24 to 96 inches (60 to 240 cm). Hedgiflora Plants range in height from three inches to six inches (7.5–15 cm) with some varieties reaching above 20 inches (cv. Tidal Wave). The spread of Hedgiflora is usually in the range of 36 to 48 inches (90–120 cm). Petunia surfinia are typically 5 to 7 inches (12.5–17.5 cm) in height with a spread of up to 96 inches (240 cm). Grandflora species range from 8 to 24 inches (20–60 cm) in height and spread to 36 inches (90 cm). Leaves are simple, alternate, lanceolate to ovoid, and pale green. Stems are long and limp. They bloom continuously from the end of spring, throughout summer, and for many cultivars until the first frost. There are numerous flower colors available including red, white, pink, purple, blue, and yellow. Bi-colored forms are available. Perfect flowers can be single or doubles, have five petals, are fragrant at night, and trumpet shaped. They have finger like green sepals. These fast growing half-hardy annuals grow well in all growing zones. Petunia × hybrida should be grown in full sunlight for best results; some cultivars will do fine in lightly shaded conditions. Soil should be moist with good drainage. Add organic matter. Ideally, the pH will be in the range of 6.0 to 7.0. Plant will struggle in high pH soils, and iron deficiency can be a problem. As they are fast growing, they tend to require a lot of care/ are high maintenance. When growing from seed always use packaged seed, as harvested seed usually reverts back to white flowered form. Note that Petunia surfinia should only be grown from cuttings. Sow seeds indoors, on the surface, about eight week before transplanting outdoors following the last frost. Seeds typically take one to three weeks to germinate in the light, at a temperature of 70 to 80°F (21–27°C). Space at about 8 to 12 inches (20–30 cm). To propagate from cuttings. Cut below the leaf node, ensure that there are at least three leaf joints on the stem. Snip off lower leaves and any flowers. Poke a hole in soil with your finger, plant the cutting. Water well. Place in an area with good light (but not direct sunlight). Maintain a moist (but not saturated soil), also spray the leaves with water. Cuttings may appear limp until roots have started to develop (2–3 weeks). Once roots have established from the cutting they can be transplanted to their final location/pot/container. Provide plenty of water for the first couple of days after transplanting. Supply a general-purpose fertilizer monthly (once established). This should be followed by deep watering to help spread the feed to the roots. Petunia are thirsty, so water once a week to a depth of 6 to 8 inches (15–20 cm) in the morning (this will prevent powdery mildew and root rot). Do not water again until the soil has dried out completely. In hot periods, plants may require watering more often. 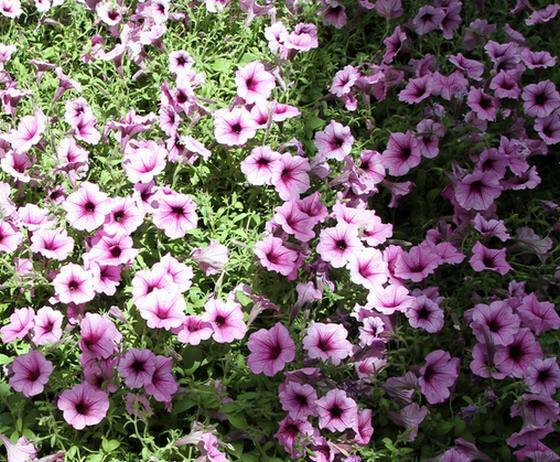 Although Petunia make fantastic container plants, beware that spreading varieties are very thirsty and may require watering twice a day in warmer periods. As they are always in bloom they are always hungry and usually need to be fertilized every three to four weeks when grown in containers or baskets. Pinch young tips to encourage bushy growth. 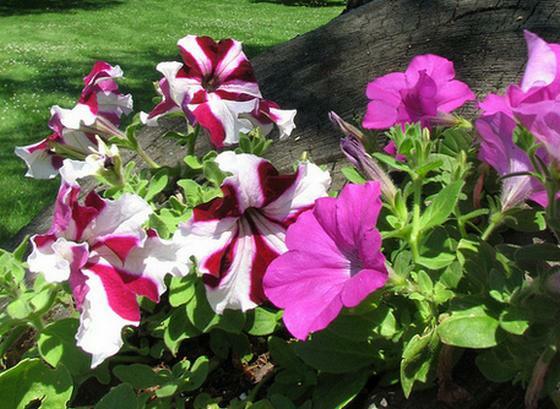 If growing older Petunia varieties then deadhead spent flowers and remove old stems to encourage further blooming. To deadhead Petunia, pinch down the stem to the next flower bud. Deadheading flowers once they have fade will help to keep plants looking nice and encourage blooming in all cultivars. Supply a much of wood bark or chopped leaves to a depth of 1 to 2 inches (2.5–5 cm) to help maintain moisture. Plants may develop rotten roots if grown in water-saturated soils. Common pests and diseases include aphids, caterpillars, whiteflies, leaf miner insects, slugs, powdery and downy mildews, and viruses.